Federal safety investigators on Tuesday questioned transportation officials about last year's Amtrak train derailment south of Seattle that killed three people and injured dozens, focusing some questions on the curve where the train derailed. 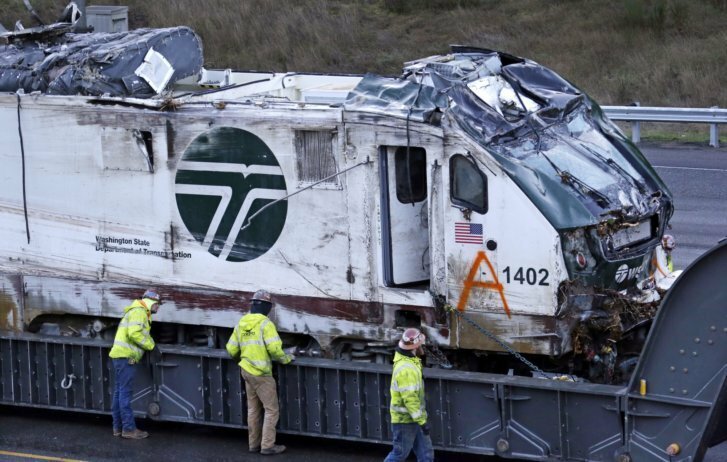 SEATTLE (AP) — Federal safety investigators on Tuesday questioned transportation officials about last year’s Amtrak train derailment south of Seattle that killed three people and injured dozens, focusing some questions on the curve where the train derailed. Investigators quizzed the parties on a number of issues, including safety measures taken at that curve where the train derailed, how engineers were certified and trained on new routes, how safety was coordinated between so many parties and why a new safety technology known as positive traffic control wasn’t installed. The engineer previously told investigators he knew the curve with a 30 mph (48 kph) speed restriction was at milepost 19.8 and he planned to start braking about a mile before reaching it. But he said he didn’t see a marker at milepost 18 or a nearby speed warning sign. “The odd thing is that this curve was very much on his mind and yet he still missed it,” Sumwalt said.